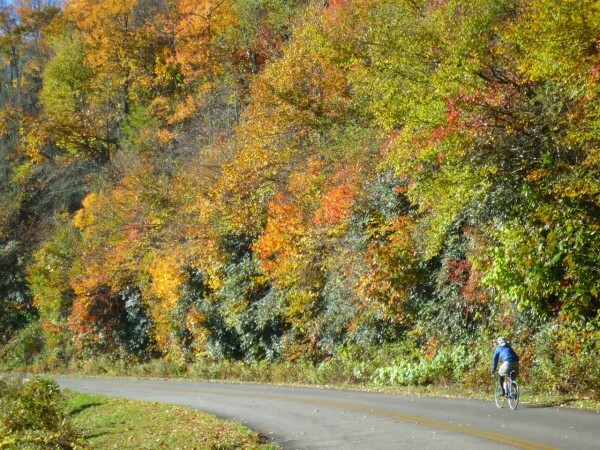 The Blue ridge Parkway ride meant many things to me. It was a strengthening of bonds among friends by sharing an activity together – riding the 470 miles with 50,000 of vertical feet of climbing. It was the strengthening of bonds between friends by the breaking of bread and drinking of wine together and the telling of the day’s stories of our rides around the warm campfire. It was also a chance to be closer to God and that for me is accomplished in the wilderness away from distractions of life like: cell phones, traffic, cars, time schedules, rules and regulations. Having never been to a football, soccer, hockey or baseball game, I value trekking, Mountain climbing, fly-fishing, scuba diving and biking because they are individual sports and take you into the wilderness and away from the crazy life we all live. It is here I feel and see God’s greatness. I tried to leave early in the morning when things were quit to be totally in God’s surrounding with no distractions and during the early morning ride, I saw the earth turn and the sun stream it’s crimson rays brushing my face in its warmth. The Golden orb set the clouds on engine on fire in an orange glow as they drifted on the wind across the dark blue sky to the horizon. I listened to the drops of water, fall in a synchronized timeliness order (like a metronome) from the rocks cliffs above onto the forest floor as I rode in silent grace. I saw the wind and to quote a distorted RLS poem this is what I saw. I saw you toss the leaves on high and blow the birds about the sky and all around I heard you pass like ladies skirts across the grass. I saw the different things you did and always you yourself you his, I felt you push and I heard you call but could not see yourself at all. O wind o blowing all day long o wind that sings so loud a song. I listened to the crickets chirp in the last days of autumn and watched eagles and hawks soar overhead in silent grace looking for their next kill. Whitetailed deer ran through the forest floor as I would approach in silence and the squirrels and chipmunks were all about. I held a few funerals for the dead animals I found in the road and placed their bodies back into the woods for proper burial. I wrote the following prayer on Aconcagua at about 21,000 feet it is appropriate here for the Blue Ridge Parkway ride as I was “Miles From Nowhere” surrounded by God’s presence. Today in the wilderness and on this majestic mountain, I see Your greatness in all that surrounds me and the Heavens proclaim Your glory. The majestic white capped mountains beneath the clear blue skies with the bright orb covering the earth in golden rays and with the twinkling of stars at night, they all displays Your handiwork. The rolling hills and the green valleys cut by gushing streams below us disclose Your presence.